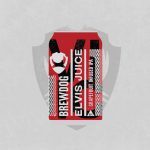 An American IPA with a bitter edge that will push your citrus tolerance to the brink and back; Elvis Juice is loaded with tart pithy grapefruit peel. This IPA has a caramel malt base, supporting a full frontal citrus overload – grapefruit peel piled on top of intense us aroma hops. Waves of crashing pine, orange and grapefruit round out this citrus infused IPA.